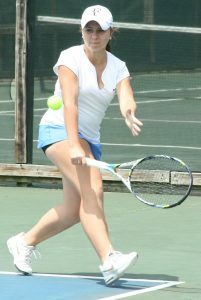 Chamblee’s Olena Bilukha (47-0 in 3 years of singles) leads the undefeated Lady Bulldogs into the state playoffs. Three of six DCSD tennis teams advanced in state tennis playoff action on Monday and four more are in action today depending on the weather. The Tucker Tigers improved to 13-2 on the season with a 5-0 sweep of Brunswick in Class 6A state tournament play at Sugar Creek Golf and Tennis Center on Monday afternoon. The Tigers got wins from junior Shawn Lunde (No. 1 singles), sophomore Usman Jamal (No. 2 singles) and Malik Shakir (No. 3 singles). Junior Revaz Sharma and freshman Carter Foley won at No. 1 doubles while seniors Bryce Brechin and Adonis Jett made it the clean sweep with a win at No. 2 doubles. A matchup the winner of Region 8-6A No. 3 seed Gainesville and Region 6-6A No. 2 Creekview awaits the Tigers. A date and time will be set once the winner is decided. Tucker also easily swept the Brunswick girls 5-0 to push their record to 13-2 on the season as well. Junior Daelyn Turner (No. 1), senior Ryan Vaughters (No. 2) and sophomore Jade Warupa (No. 3) all won their singles matchups. Juniors Kelsey Hayes and Sarah Penkava won the No. 1 doubles match while seniors Cydnie Cole and N’yema Holloway finished off the 5-0 win with a victory at No. 2 doubles. Region 4-4A No. 2 seed Druid Hills knocked off Region 2-4A No. 3 seed Spalding 3-0 in Class 4A girls’ state tournament action at the DeKalb Tennis Center on Monday. Ayla Anderson took a 6-4, 6-4 victory at No. 2 singles and Emma Kate Beckwith cruised to a 6-0, 6-1 triumph at No. 3 singles. Julia Bartlewski and Sammi Gerwitz closed out the 3-0 match win with a 6-1, 6-1 victory at No. 2 doubles. Druid Hills advances to play the winner of Region 8-4A No. 4 seed Madison County and Region 6-6A No. 1 seed Heritage-Catoosa. A date and site will be set once the winner is determined. In other action on Monday, the Lakeside Lady Vikings (8-10) fell 3-0 to South Forsyth in Class 7A girls’ play while Stone Mountain’s first appearance in the state playoffs since 1996 was short-lived with a 5-0 loss to North Hall in Class 3A girls’ state tournament action. The Arabia Mountain Rams (4-4) had their first state playoff appearance cut short with a 5-0 loss to Cass on Monday. Four more teams hit the courts today (Tuesday) led by the undefeated Chamblee Lady Bulldogs (20-0). Chamblee plays host to Woodland of Cartersville at 2:30 pm at Chamblee High School on Tuesday. The Lady Bulldogs led by junior Olena Bilukha who is undefeated (47-0) in singles play in her three years at Chamblee and senior Leeza Ershtein who is 19-0 on the season. Chamblee won the Region 5-5A girls’ championship and are making their seventh consecutive playoff appearance having advanced to the Elite 8 in 2014 and 2016. In other Class 5A girls’ state tournament matchups, Columbia (7-4) travels to Kell (18-0) for a 3:00 pm contest and Southwest DeKalb (8-12) goes on the road to Carrollton (16-4) for a 5:00 pm match at Sunset Hills Country Club. The Clarkston Angoras are making their second consecutive trip to the state playoffs and second overall as they travel to Carrollton for a 3:00 pm match.